FOR too many years come Christmas time and the wheels would fall off Noosa's road network as the Grinch drove gridlocked mayhem down Noosa Pde, Noosa Dr all the way into Hastings St. 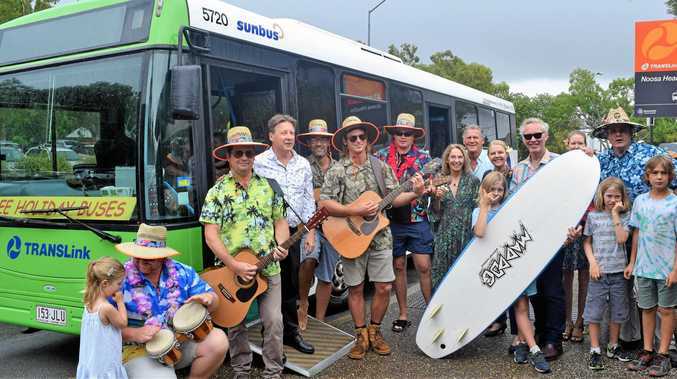 But now with Keith the tropical-shirted bus driver in charge of one of the Noosa Junction to Hastings St shuttle runs, "the wheels of the free buses go round and round” as the Go Noosa trial was launched to the happy tunes of musical council staffers called the Surfing Turkeys. "Today we're launching what is really the most significant practical effort in the history of Noosa that's ever been undertaken,” Cr Wellington said. The mayor said these initiatives were aimed at "improving the way people get around during the peak holiday season”. He said this has come about because of a "council that is committed to tackling this long-standing issue”. Cr Wellington said after hopping off at the Hastings St transit stop, this was the first suite of trials "that will continue to roll out over the next year or so”. 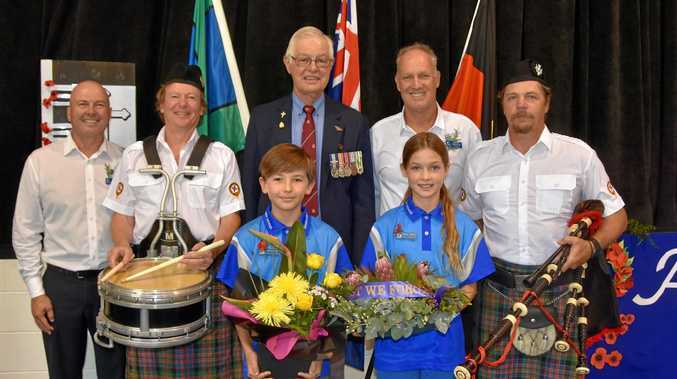 "This is just the beginning of a long-term plan to shift people away and goods away from the traditional means of travelling around the shire,” Cr Wellington said. He said this will include the free holiday buses on six Translink services that will be extended to the whole school holiday period until January 28. "The bus drivers will be wearing fabulous tropical shirts, and there will also be friendly traffic controllers down here at the roundabout in Hastings St. They'll be sporting holiday hats ... we wanted to dress them in funny clothing but apparently we're not allowed to so that. The mayor said motorists will be encouraged to park and ride especially at Noosa Junction whose parking spaces do not fill up even at peak time. He said buses will be leaving between the Junction and Hastings St every seven to 15 minutes. He said previously the park has been available to park for 10 days, this year that has been extended to 28 days. Intelligent roadside information boards will alert motorists of the car parking capacity of Hastings St "so people can make an informed decision whether to have a crack at parking in Hastings St or rather jump on an easy street bus”. There will be more scooter and bike parks in the street and there will be the 12-month trial of a ride-sharing car pooling app for Hastings St employees. He said Go Noosa part of 10-year transport strategy being spearheaded by a dedicated implementation team headed by Adam Britton and Joanna Ferris and funded by the sustainable transport levy plus some of the revenue for Lions Park parking. Cr Ingrid Jackson said she was excited by this trial and she was "really keen to get feedback from people as to whether this was reducing congestion”. Noosa MP Sandy Bolton was delighted by the council initiative. Noosa Junction Association president Michael Tozer was delighted with Go Noosa for the connectivity it will give between Hastings St and the Junction. "This will increase passing foot traffic in the Junction which can only be a good thing for traders,” Mr Tozer said. Hastings Street Association's Jan Sinclair said: "Our shared goal has been to make it the best possible experience it can be for our visitors and locals and getting people out of their cars and into holiday mode as quickly as possible has been the key," Ms Sinclair said. For more information about the Go Noosa trials including frequently asked questions visit the Noosa Council website at www.noosa.qld.gov.au/go-noosa or call 5329 6500. Bus timetable information is available at www.translink.com.au/noosa or call 13 12 30 anytime. A weekend timetable will operate on public holidays with most free bus services terminating around 7pm. Route 627 - Tewantin to Sunshine Beach via Noosa Heads. Route 628 - Noosa Parklands to Noosa Junction via Noosa Civic. Route 629 - Tewantin to Noosa Junction via Noosa Civic. Route 632 - Noosa to Cooran via Cooroy and Pomona.